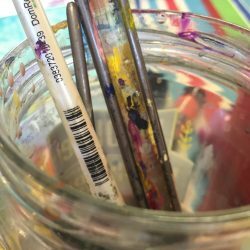 While some of my art journal entries use images of people and things, many of them are simple, stream-of-conscious designs . I tend to use a lot of circles. This is from my first visual journal (an altered book). The background is made by tearing out phone book pages and layering them over the existing book. I then glued on patches of pink tissue paper. I used transparent green glazes to add a contrasting color, then opaque white to balance the black charcoal. Although this isn’t an image of a real “thing”, to me it reminds me of a totem, a pair of eyes, or even an abstracted female figure. Like this? 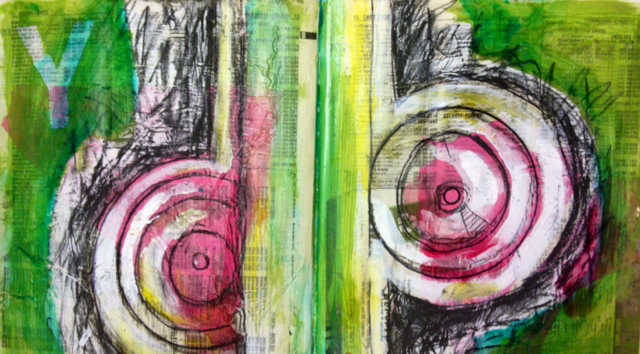 You can see more of my art journals HERE — updated frequently.